from 14 to 20 July 2014. The special requirements of the aviation industry also regard the further development of machining strategies and tool support for the hyperMill® CAM suite. As such, one key improvement of version 2014.1 involves the use of barrel cutters in different designs. The large effective radius of the thin tools allows 5axis cutting with greater step-over distances. This reduces machining time and achieves a high level of surface quality. These are key factors for economical production, which is particularly important in the aerospace industry. OPEN MIND works with well-known users from the aviation industry to further develop the technology. The necessity for fast and tool-friendly stock removal of high-quality materials makes the hyperMAXX® high-performance cutting strategy particularly interesting for the aviation industry. It is now possible to use the module for new features in the 5axis shape-offset roughing routine. When converting from 3axis toolpaths to 5axis toolpaths, different tool types, such as barrel and woodruff cutters, can be used. Users also have more options when projecting reference toolpaths. The functions for automated machining of turbine blades will undoubtedly prove to be a top highlight for programmers from the aviation industry. To this end, the interface of the ‘single blade’ package has been improved and simplified It is now possible to use full feature support for turbine blade cycles. This results in lots of opportunities to automate CAM programming. These are available at all times without re-selection thanks to the central management of all geometry data in one feature. 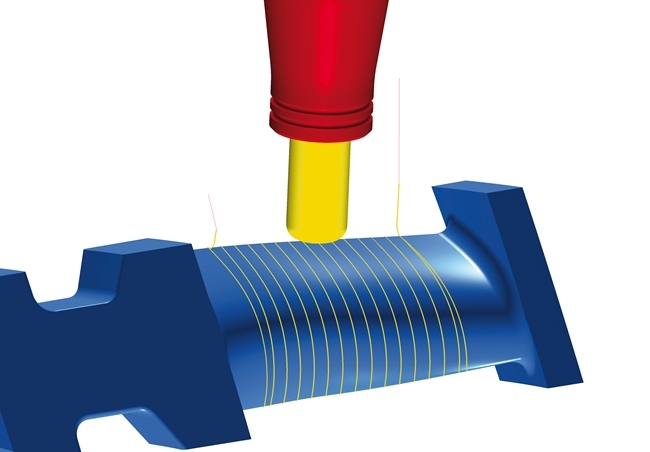 The ‘platform machining’ cycle is another example of efficient programming. Targeted machining of hub or shroud surfaces is possible through simple switching in the user interface. And independent angle values can be specific near the root and tip platforms. ShopViewer allows the machine operator to check and simulate manufacturing processes directly via the monitor. The display, analysing and documenting of processed CAD/CAM data in the workshop improves the traceability of the manufacturing process via the toolpath simulation, the material removal simulation and the internal machine simulation. This delivers valuable feedback. Experienced machine operators can recognise possible errors early on using virtual process analyses.